Hey there friends! 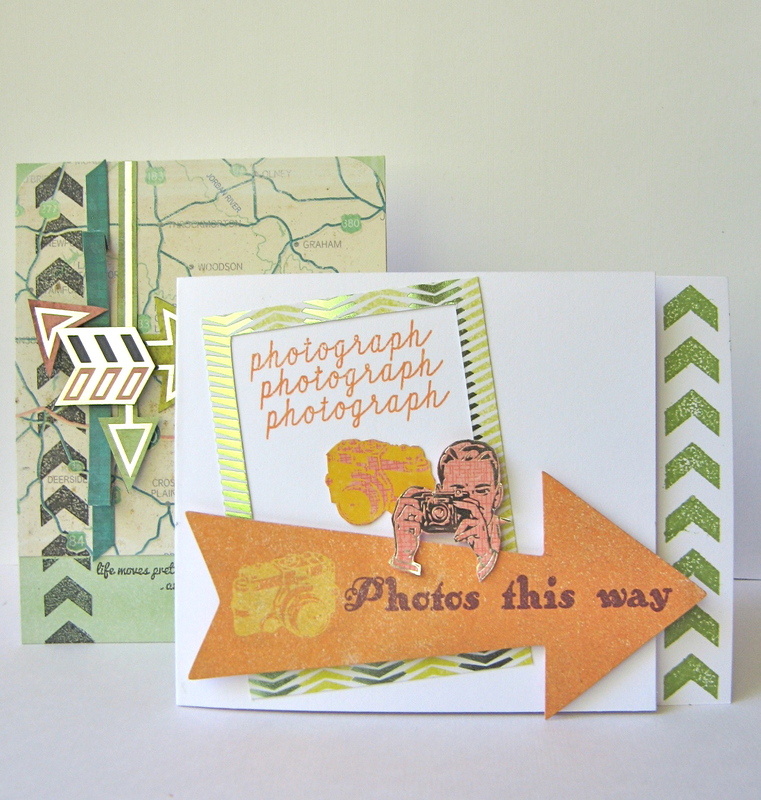 Today I am going to show you how you can integrate stamping into your cardmaking with two different cards. 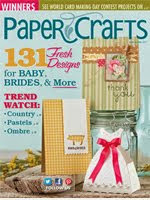 I love layering patterned paper and using stamps to compliment a paper collection. Sometimes it can be hard to pick a stamp set to work with. Should you choose to make a card focused around a stamp motif adding patterned paper you think is pretty, but not really appropriate? 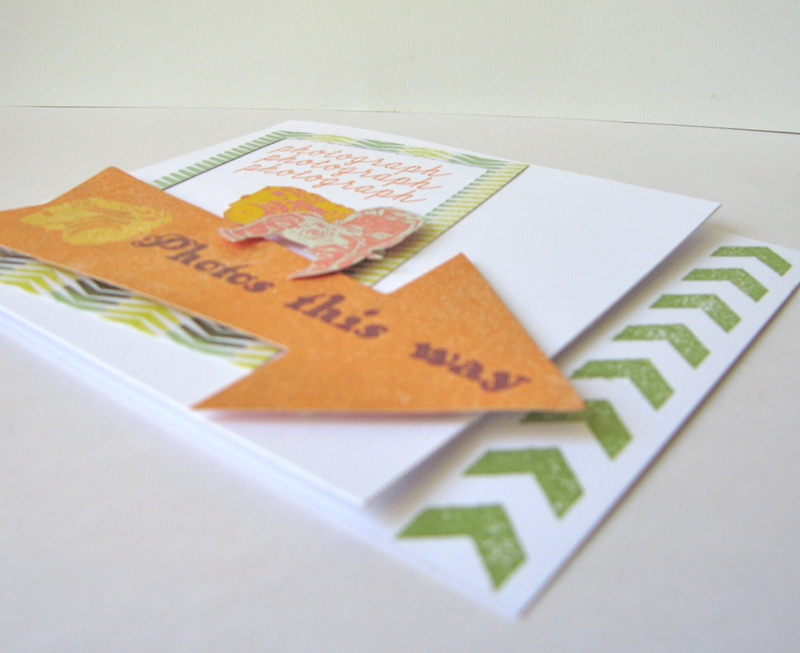 Should you use a patterned paper to set the tone of the card, hoping the stamp will just fit? Starting off can be hard, but the following suggestions should help you make a card that's the perfect mix of stamping and paper layering. 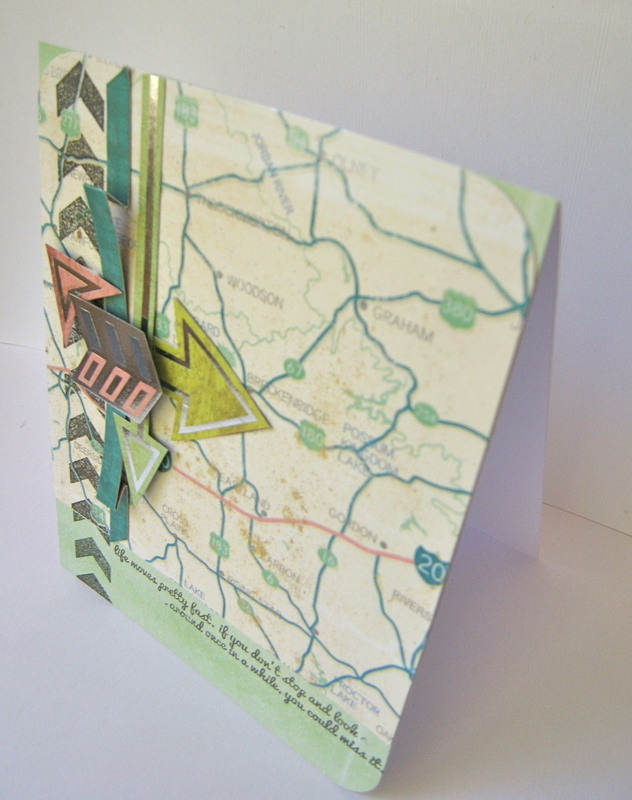 For this card I wanted to create unified design using patterned paper and a stamped image. One of the easiest ways to select patterned paper for a card is to choose a maximum of three coordinating patterns and/or colors to work with so that you're not overwhelmed with too many colors or patterns. For the first card I chose to use Lime Rickey, The Big Slab and Boogie Woogie from SEI's Mayberry collection. The map image, arrows and coordinating colors worked really well with the stamp set from Studio Calico. Once you have the papers selected choose one strong stamp or border image and a sentiment if you like. I like stamping images directly on patterned paper sometimes, but you can also stamp on cardstock. Try playing around with where you'd like to place the image. Don't be afraid to try something new, whether in placement, direction or a stamping technique. 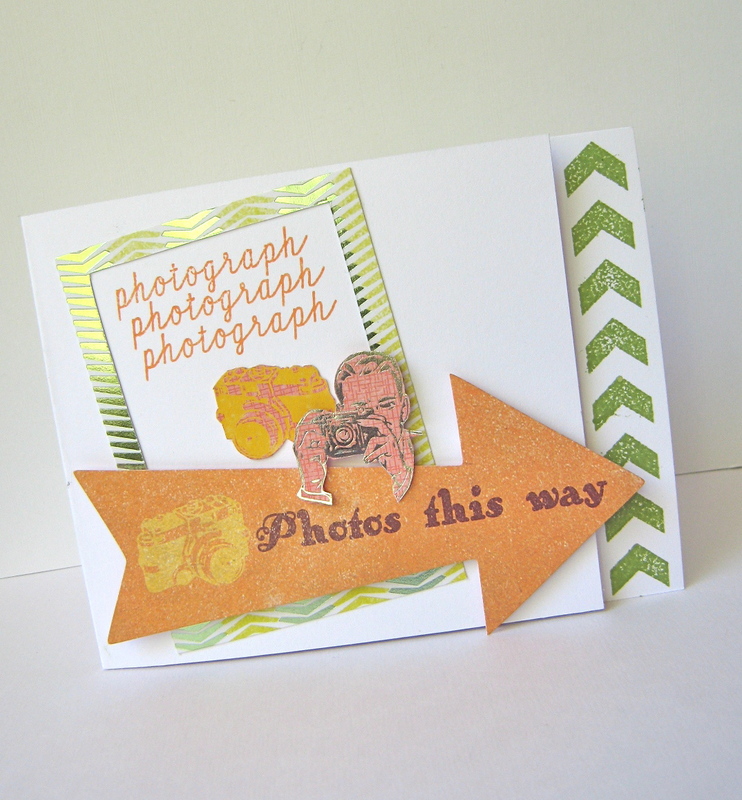 For this card I chose to place the border stamp on one edge, and stamp the sentiment below the patterned paper map. The sentiment was too long for where I wanted to place it so I decided to divide the sentiment into two lines, stamping half the sentiment on the top line, and the other half below. I love layering patterned paper, so I fussy cut some arrows from patterned paper an added it near the arrow border to add dimension and unify the stamp to the design motif of the card; direction. For the next card I chose another easy idea for incorporating stamping in my cardmaking; coordinating your stamps and patterned papers. I liked the word "photograph" from a Studio Calico set, but I also liked the nostalgic camera images from "Nostalgia" which is from SEI's new Mayberry line. So, I decided to combine them creating a theme for the card. I stamped the word repeatedly and fussy cut a camera and a man taking a picture. Then, I trimmed a polaroid from "Jive." To utilize the negative space in the card, I placed a large arrow over the polaroid directing the viewer's eyes to same arrrow border from the first card, unifying the duo. Unlike the first card I stamped directly on the cardstock instead of patterned paper. To make this card a little more interesting and more dimensional, I trimmed away some of the card front and stamped the arrow border on the inside. Stamping on cardstock doesn't need to always be flat, playing around with the placement of a stamped image can make a simple card even more dynamic. Well, that's it for me today! 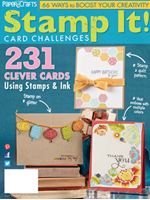 I hope that you'll be inspired to try using stamping with your patterned paper. 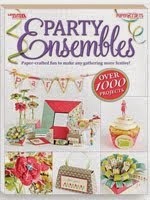 Patterned paper: (Lime Rickey, The Big Slab, Boogie Woogie, Nostalgia from Mayberry collection) SEI. 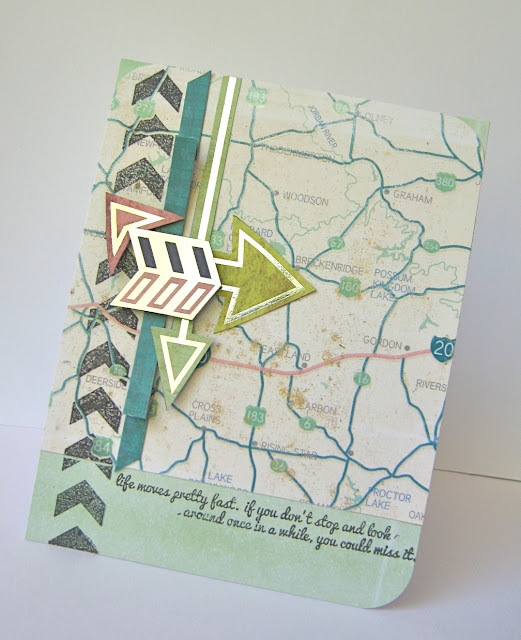 Accents: (Arrow die cut from Mayberry collection) SEI. 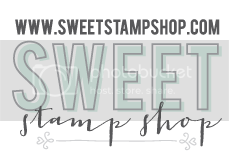 Clear Stamps: Studio Calico. Dye Ink: (Tuxedo Black, Tangerine) Tsukineko. 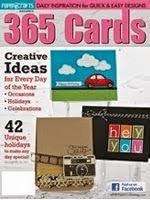 SUPER SUPER cute cards! 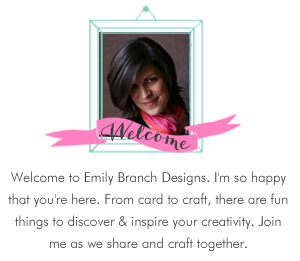 I loooooooooooove your designs and I LOVE the arrows you've used! I love love love everything you make! 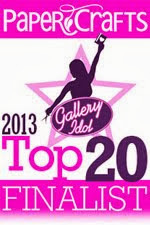 You are super amazing!